Ok I have just one doubt. Is this mod going to be compatible with the fossil archeology mod? Because the 1.4.6 version works in 1.4.7 as well. Digging the look of it and the dinosaur choices. Any more obscurer ones to come in the future? The Emperor's Rage echoes through the hills. The Emperor's Strength grips this land with fists of iron. The Emperor's Courage burns everlasting. The Endless Army will crush the Emperor's foes. We're trying to include obscure (but awesome) species as well as famous ones. Expect to see well-known animals like Tyrannosaurus and Triceratops alongside lesser-known ones such as Therizinosaurus and Anurognathus. +1 for including cool dinosaurs instead of just the five or so most famous ones. Nice models, too. Will you be separating the dinosaurs so that you only encounter ones from particular time periods together (Vaguely, I mean. Like, no Tyrannosaurs munching on early Triassic species)? I will be following this mod with interest. Different dinos will spawn in different biomes when we add the dimension in. And large sauropods like Armargasaurus are planned, so you're in luck! Planned for Wave 2. Uh, pretend you didn't read that, everyone. Spoilers! The mobs look really cool but I hope you guys plan on doing something other than just having them spawn in the overworld. It might have already been done before but I hope theres some sort of genetic engineering involved so the player has total control of when and where the dinos appear. Ive always wanted to populate an island with dinos. At least at first, dinos will be spawnable with craftable spawn eggs. Once the mod develops a bit further, we're planning on having a dimension where they spawn normally as well as configuration options that can make them spawn in the normal world (and other stuff too) if you want. 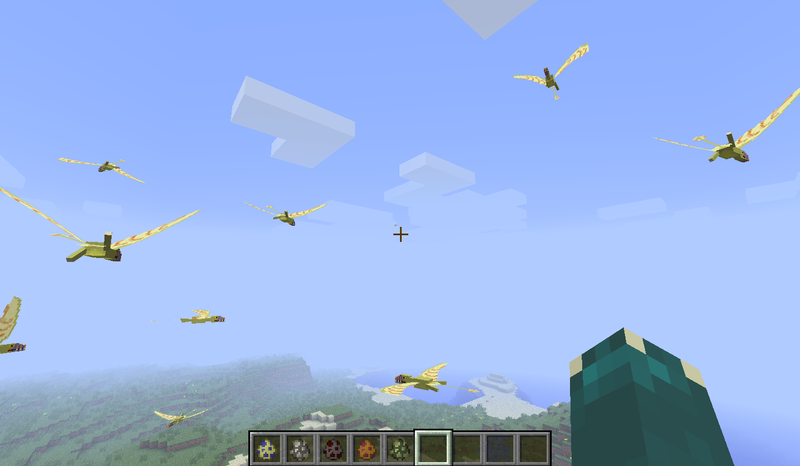 We're trying to make this mod both fun and different from mods like Jurassicraft and the Fossil/Archaeology Mod. I want to help, im working on a Chamsmosaurus Belli ATM Well that crashed. Im just going to do small dinosaurs for now. Can we expect a release in the next week? A prerelease, perhaps. I'll try to get my coder to work on it. Let's have a big hand for Fisherman77, who's Dimorphodon coding is, in a word, FREAKING AMAZING. Seeing more and more mods like this is really quite awesome. I actually have a YouTube channel pretty dedicated to Fossils and Archeology, I feel they would take a strong liking towards this mod and would be interested in making any videos or advertisements for it. I feel I could help get a strong following for this mod. On a side not I've been looking to set up a Fossils and Archeology server for quite some time now, but due to its inconsistency and bugs have been unable to. I'd be interested in possibly having a server for this as well. I've hosted server for about 3 years now, but only two minecraft servers. Nonetheless this mod looks promising and an active dev team is appealing looking at other related mods. Really looking forward to see what this brings. Thanks! Once the mod's pre-released, I'd love to see you do a review of it. Wow I cant wait for this mod to come out XD. Will there be rid able dinosaurs? We're planning to have some, yes.